My youngest son, the B-meister, is a pretty funny character at the best of times, remember his Halloween request? Well his obsession with the canada goose is in full throttle now that we are well into March. He knows this is the month they return. Every morning he wakes and tells me a goose fact or two and then takes his place by the patio doors in hopes that this will be the day. His optimism is exciting and we can't help but get on board with him. To celebration the imminent return of the goose there's been some extra special creating going on around here. It's of a fowl nature so keep that in mind as you continue on through this post. 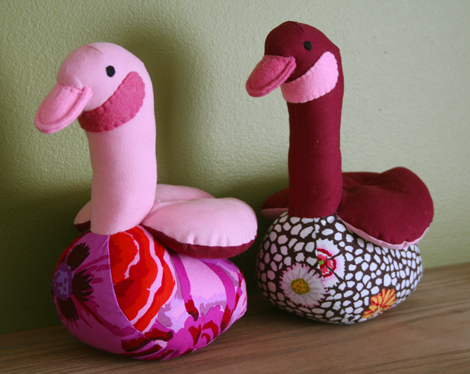 The girls (Miss A & Miss J) have been nagging asking me to make them some geese. Thankfully it was of the softie variety and not the "up your nose" fun fur. Been there, done that. Ultimately I succumbed to the pressure and agreed. What did I get myself into now? It began with a sketch, drawings that resembled a goose before being transfered onto paper to make a pattern, and then onto the task of prototyping the pattern with fabric. This is where it always gets tricky. There is always one part of the pattern that inevitably needs to be re-worked over and over and over and over...you get the picture. Well after about the 8th or 9th goose head, tenacity can be a good virtue, the goose pattern was pretty much complete. Time to bring out the pretty fabrics :) Kaffe Fassett all the way baby. 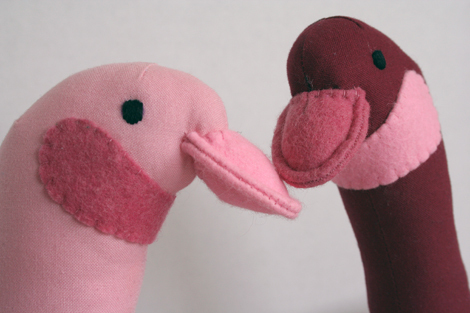 The details were finished in the wee hours while the kidlets slept; embroidered eyes and wool felt beaks and neck bands. In the morning when they awoke the girls found a few new friends sitting on the coffee table. 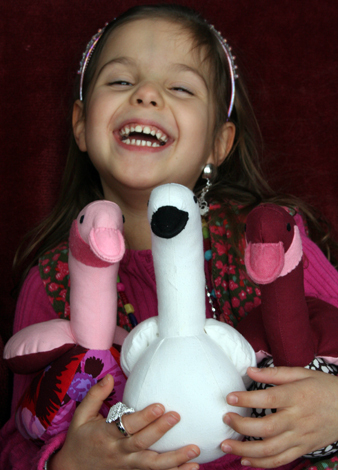 Apparently they are loved by all because I now have a couple more geese to make for the big brothers. Today the house is filled with all manner of goose honking...imagine how loud it's going to be when the geese actually arrive? Can you tell we've missed seeing them? oh i love them, tam! I love all the sparklies on that girl child of yours! I love canada geese and this is perfect! Wow, those are so sweet! I want to come live at your house for awhile and learn to make neat things. Let us know when the geese return...how exciting! PS...I hope this comment posts. I tried to comment before and it didn't work.